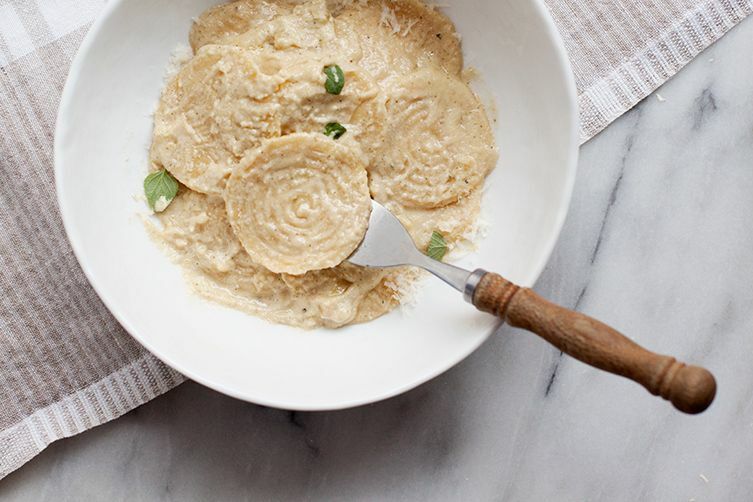 More than just a pretty face, these embossed pasta medallions are also great at holding sauce. 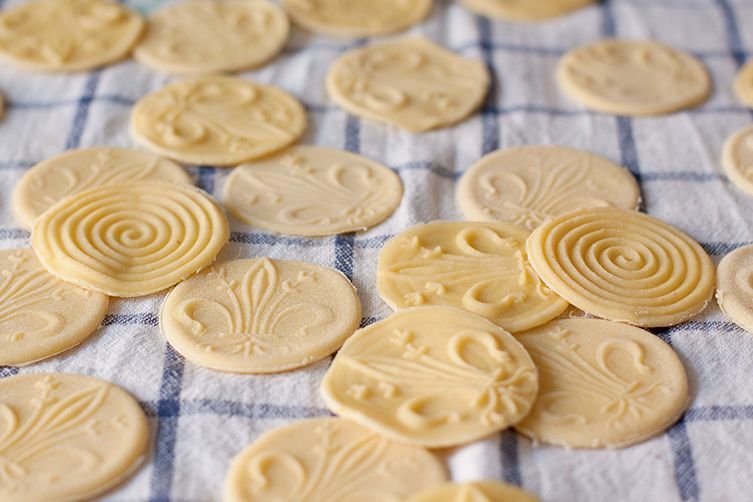 With their double-sided embossed designs, these fresh corzetti pasta from Italy's northwestern region of Liguria appear fanciful and pretty. But when it comes to pasta, function is just as important as good looks. The embossing helps to hold sauce so much better than a simply flat, slippery surface. And it's a way to add a personal touch to your creation; that may not be so relevant now, but during the Renaissance, corzetti was decorated with the crests of noble families—a monogrammed, instantly recognizable pasta. 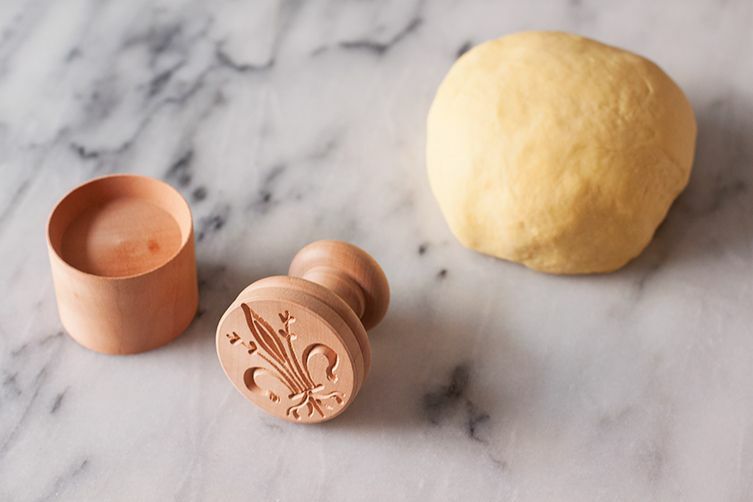 The stamps, made of the hard wood from fruit trees, consist of two parts: the press has the design that's embossed onto the pasta; the other piece is a concave cylinder used to cut the round shapes. Once you've cut the circles from the pasta, the round of dough gets sandwich between the two parts of the mold. The underside of the concave piece sometimes has a simple design on it, too (like a cross—supposedly the origin of the name corzetti, as a small cross is a cruxetta in the Ligurian dialect—or, as you can see below, a series of circles). In that case, the pasta is embossed on both sides, which gives it maximum surface area for sauce—and flavor. In the streets of downtown Genoa, you can still find artisan workshops where these wooden stamps for corzetti are made by hand. Otherwise there is always the internet (you can even get a custom-made stamp on Etsy!). 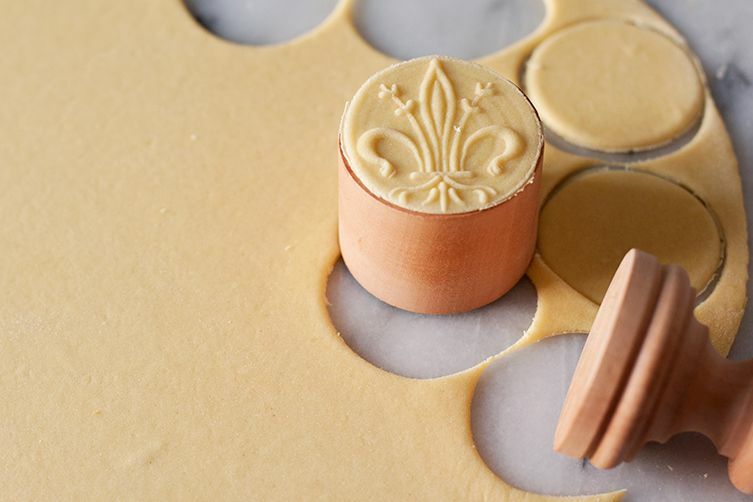 If you want to try making these before you committing to buying a corzetti stamp, you can improvise: A 5-centimeter round cookie cutter (or even a glass!) 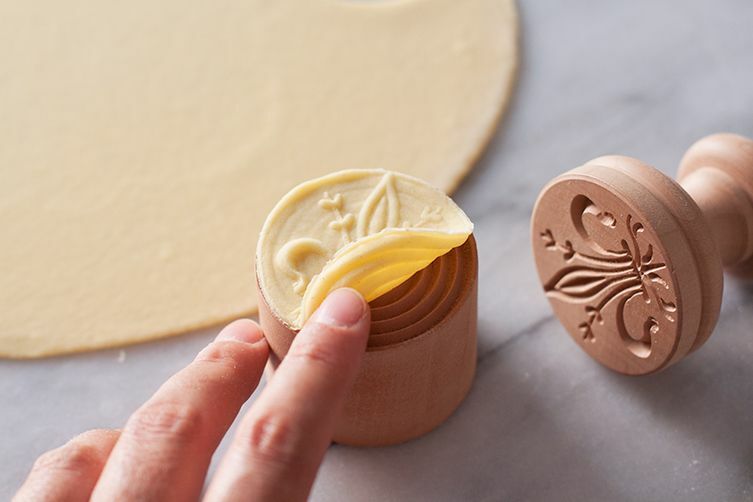 can cut out the rounds, and there are a plethora of cookie molds (even wooden ones that are very reminiscent of the corzetti stamps) that could work in a similar way. Fresh marjoram is a lovely, classic herb to use with this pasta: Some people put the chopped fresh herb in the pasta dough itself, while others serve make a marjoram pesto to serve on top. 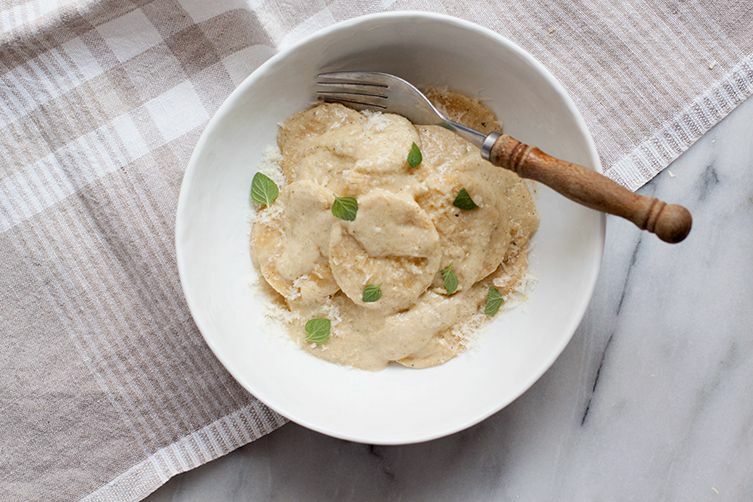 You'll also find corzetti tossed with a simple wild mushroom sauce—fresh mushrooms are sliced, tossed with garlic, olive oil, and fresh herbs and served over the freshly boiled corzetti—or, as in my recipe, a creamy walnut or pine nut sauce. In the town of Novi Ligure, which sits on the border of Liguria in Piedmont, corzetti are often imprinted with a flower design and served with a hearty sausage and mushroom ragù for a religious festival. 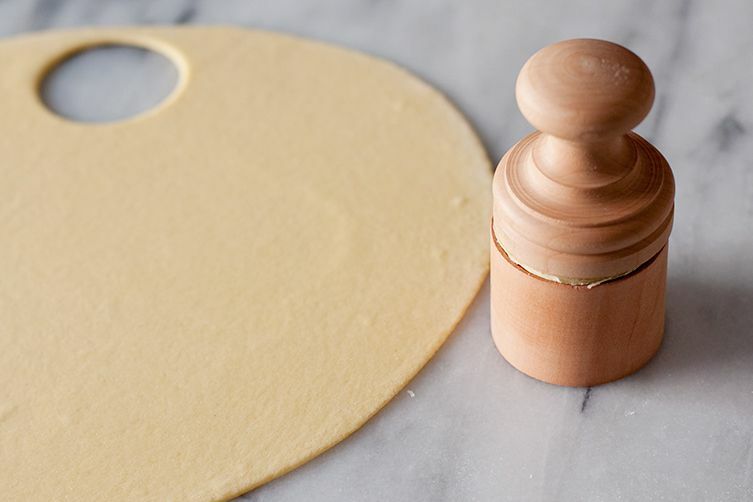 A few notes on the dough, which is slightly different from regular pasta dough: White wine is a common ingredient (you can use water instead if you wish), which means there is usually one fewer egg than in the typical pasta dough (the common ratio is a very convenient 100 grams of flour and 1 egg per head). The dough is often is perfumed with nutmeg or herbs, and there's even a green version that's made by incorporating spinach. Since Italian eggs are fairly small, usually 50 grams each, you may find you need fewer eggs here. If the dough is little dry, add a splash more wine. After it's rested, you're free to roll it out and print away. It takes a bit of love and patience to make these, so get someone else on board to help you (it's more fun that way and takes half the amount of time). If you happen to like craft projects, this is like the ultimate edible craft project. looks great - this will be my first attempt at making pasta from scratch - thanks a lot. Do think it will work with half whole wheat flour and half app purpose? I wouldn't recommend using whole wheat flour for this, it will be quite a tough/hard dough to work with and you can risk making it too thick with this style of pasta (which should have some thickness/bite to it but if it's too thick it will be too tough or won't cook properly). I'd recommend trying it first with just all purpose flour and see how you go! Once you're more comfortable with it you can experiment with other flours (farro or spelt flour and chesnut flour are favourites of mine! ), which I think generally work best with making tagliatelle or pappardelle (long thin strips). Hope that helps!